President’s Day is truly one of my favorite holidays – for me it is a time to reflect on the fore fathers of this great country and what they did for us. Though I know it’s a celebration of both President George Washington and Abraham Lincoln’s birthdays, for me I am reminded of what they did – the rights they carved out for all of us and the freedom that promises. I came to the United States as a refugee when I was just 12 years old. As soon as I turned 21, I couldn’t wait to take the test, and then the oath, to become a US citizen. I will always consider Italy my home, but America is my home now too. For that, I offer you one of my very favorite comfort foods, an Italian-American lasagna. I am always telling you not to add oil to the water when you cook pasta because it will reduce the adherence of sauce to the pasta. Cooking long, flat pasta—like these lasagna noodles—is the exception. They have a tendency to stick together when they cook; the oil will help prevent that. Inevitably, some noodles will break. Save the pieces, they will come in handy to patch the layers of lasagna. You’ll notice in the meat sauce recipe that the final consistency of the sauce should be fairly dense. Following that pattern, I suggest you drain the ricotta first to remove a lot of the moisture. 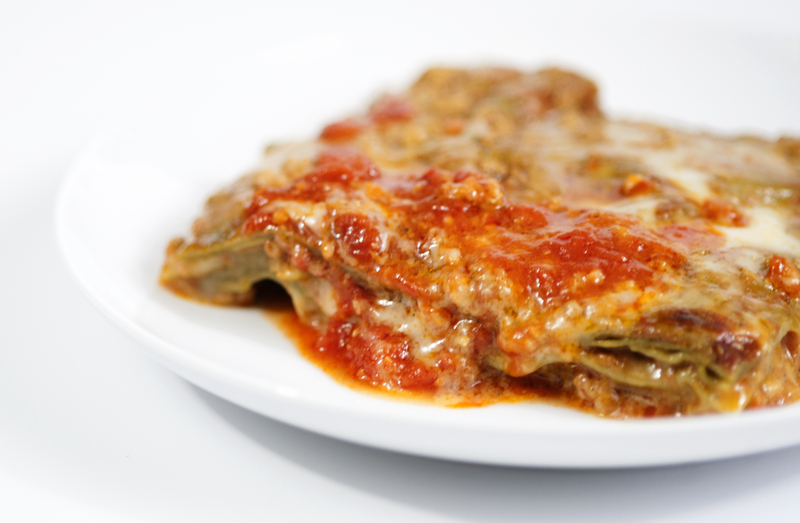 Removing excess moisture from the ingredients will result in a finished lasagna that is more intense in flavor. You may assemble the lasagna completely up to a day before you serve it, but don’t cook it until the day you plan to serve it. Lasagna tastes better and is easier to cut if it is allowed to stand about an hour after it is removed from the oven. It will retain enough heat to serve as is or, if you prefer, pop it back in the oven for 10 to 15 minutes. My favorite way to serve lasagna is to bake it and let it stand 3 to 4 hours. Cut the lasagna into portions, rewarm it in the oven. Line a sieve with a double thickness of cheesecloth or a basket-type coffee filter. Place the ricotta over the cheesecloth and set the sieve over a bowl. Cover with plastic wrap and refrigerate overnight or up to one day. Discard the liquid that drains into the bowl. Make the meat sauce. Bring 6 quarts of salted water and the olive oil to a boil in an 8-quart pot over high heat. Stir about one third of the lasagna noodles into the boiling water. Return to a boil, stirring frequently. Cook the pasta, semi-covered, stirring occasionally, until al dente, 8 to 10 minutes. While the pasta is cooking, set a large bowl of ice water next to the stove. When the lasagna noodles are al dente, remove them with a wire skimmer and transfer to the ice water. Let them stand until completely chilled. Repeat the cooking and cooling with the remaining two batches of lasagna noodles. When the cooked noodles are chilled, remove them from the ice bath and stack them on a baking sheet, separating each layer with a clean, damp kitchen towel. While the noodles are cooking, beat the eggs with the salt in a mixing bowl until foamy. Add the ricotta and stir until thoroughly blended. Preheat oven to 375 degrees F.
To assemble the lasagna, ladle about 3/4 cup of the meat sauce over the bottom of a 15 x 10-inch baking dish. Arrange noodles lengthwise and side by side so as to cover the bottom of the baking dish and overhang the short ends of the dish by about 2 inches. (A little ‘cut and paste’ might be necessary. Also, the noodles will most likely overlap in the center of the dish. That is fine.) Spoon enough meat sauce, about 2 cups, to cover the noodles in an even layer. Sprinkle the sauce with ½ cup of the grated cheese. Arrange a single layer of noodles crosswise over the cheese so they overhang the long sides of the baking dish by about 2 inches, again trimming the noodles and overlapping them as necessary. Spread the ricotta mixture evenly over the noodles. Arrange a single layer of noodles lengthwise over the ricotta, trimming the noodles as necessary. Arrange the sliced mozzarella in an even layer over the noodles. Spread 1 cup of the meat sauce over the cheese and sprinkle 1 cup of grated cheese over the sauce. Cover with a layer of noodles, arranged lengthwise. Spoon enough meat sauce, about 2 cups, to cover the noodles in an even layer and sprinkle the sauce with 1 cup grated cheese. Turn the noodles overhanging the sides and ends of the dish over the lasagna, leaving a rectangular uncovered space in the middle. Spread a thin layer of meat sauce over the top layer of noodles. Sprinkle with the remaining grated cheese. Cover loosely with aluminum foil and bake 45 minutes. Uncover the lasagna and continue baking until the top is crusty around the edges, about 20 minutes. Let rest at least 30 minutes or up to 3 hours before cutting and serving. To rewarm a lasagna that has been standing, cover it loosely with foil and place in a 325 degrees F oven until heated through, 15 to 45 minutes, depending on how long it has been standing.